Alastair Cook has revealed he cried when he told his England teammates that the upcoming fifth Test against India will be his last. England batsman Alastair Cook has announced that he will retire Test cricket following the fifth Test against India later this week. 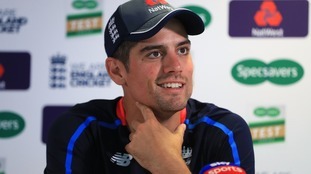 England cricket fans have voted for Essex batsman Alastair Cook to be included in the country's best-ever men's Test XI. Uncapped Essex bowler Jamie Porter has been called up to the England squad for the first time. Essex will be looking to be become only the third team in ten years to defend the County Championship. Essex vice-captain Tom Westley has set his sights on defending the County Championship title when the new season gets underway next month. Essex have signed Australian bowler Peter Siddle for the opening weeks of the upcoming County Championship season. Northamptonshire have signed New Zealand seamer Doug Bracewell for the first part of the upcoming season. Alastair Cook has admitted to doubts about his place in the England team before hitting a double century at the MCG. Essex batsman Alastair Cook hit a brilliant century as England fought back on day two of the Boxing Day Ashes Test in Melbourne.